Eco Terra mattress is carefully manufactured for people looking for an organic hybrid mattress that brings a pleasant sleeping experience. The manufacturer builds this type of mattress from 100 percent natural latex, organic cotton, and high-quality small springs. The company adds no chemical components when building the mattress, which implies that it is safe for you and your environment. Besides being an affordable mattress, Eco Terra Mattress is also comfortable and safe to sleep on. This is because it maintains your spine alignment. The Eco Terra Mattress also displays the superior features of a formidable, firm construction that begins on the plush and soft mattress cushion. Like any latex mattress that is manufactured from clean, eco-friendly materials, this mattress is hypoallergenic, dust mite resistant, and antimicrobial. When you purchase Eco Terra, you will first benefit from the no-pressure period of 90-night trial with free returns, free shipping, and a lengthy warranty of up to 15 years. This article takes an in-depth review of the Eco Terra mattress to help you learn more about the mattress and decide whether it is the best for your sleeping needs! As we mentioned earlier, the Eco Terra is made from 100 percent natural latex, organic cotton, and high quality springs. Pocketed Coils: Eco Terra mattress features 16 gauge pocketed coils that are designed to limit motion transfer as well as partner disruption. By design, the coils fit in and maintain their quality, thus helping you maintain a suitable body alignment. Quantum Coils: The mattress is surrounded by 15 gauge quantum coils that give it an extra edge support and comfort. The solid edge construction is important for sleepers who avoid the last inches of either side of the mattress to sleep at the center. The edge-to-edge quantum perimeter coils also provide you with a large sleeping surface. 100 Percent Natural Latex: The 2 ½ inches natural latex foam provides a superior buoyancy and pressure relief. Compared to Memory foam, the Natural Latex retains far less heat. The natural latex is combined with customized wrapped coils to give the mattress an extra airflow while keeping you cool and dry when sleeping. Stretch Organic Cotton Cover: The Eco Terra features a stretched non-woven material that is breathable, cool to sleep on, and has no serious patterns that affect the feel of the mattress. The well-knitted 100 percent organic cotton cover is designed to allow coils and the natural latex to move without restrictions. This enables the foam and the coils to have a better conformity to your body. Moreover, the organic cotton cover is environment-friendly. Its manufacturing does not use synthetic materials that often end up taking many years to decompose when disposed of. Flame retardant: During the manufacturing of this mattress, the company does not use harsh chemical flame barriers. As a substitute, the company uses plant base cellulose fibers and hydrated silica to deliver a safe effective solution. Firmness, Feel and Support: The Eco Terra mattress falls in the middle of the firmness and support range. It has been tested comprehensively in order to determine its exact firmness rating. Since Eco Terra has only one mattress brand, its signature firmness ratings oscillate around 5.5/10. This makes it a bit firmer when compared to average latex or foam mattress. This is an excellent level of firmness for people weighing less than 230 pounds. The mattress might not be ideal for people exceeding 230 lbs. because they might compromise its comfort after several uses. If you do not have adequate support, you will sink into the mattress. While some latex mattresses provide a little bounce and a memory form that sink too easily or even gets hot, the Eco Terra mattress has devised a better way of fighting this. If you are looking for a mattress that provides more than what Memory is offering in terms of resistance, Eco Terra mattress could be your best choice. Unfortunately, its support isn’t as excellent as its feel and firmness. Sinkage: This often depends on the comfort level that you prefer. The medium firm mattress offers more sinkage, and it increases with the weight of the body. On the other hand, a firm mattress offers less sinkage. If you are trying to decide what kind of mattress you should buy, it is essential that you consider the amount of sinkage that occurs on the mattress whenever you lie on it. Depending on how you sleep, sinkage can be the main factor in whether the mattress is worth the purchase. Most manufacturers use foam to allow additional comfort while compromising the sinkage quality of the mattress. Too much of sinkage makes the mattress uncomfortable and hot. The latex design of Eco Terra, however, allows additional resistance. Thus it does not have the sinkage problem that is often experienced with the foam mattresses. As such, most people opt for latex when looking for a new high-quality mattress. The Eco Terra mattress has the following sinkage levels that occur in different scenarios when weighing it down with 140 pounds. Undoubtedly, the sinkage will differ based on the weight of the sleeper. This mattress is designed and manufactured using high-end materials to provide a reliable product that anyone can use. If you prefer a firm mattress, you will definitely fall for this one. The feeling of the organic cotton cover while sleeping on this bed is also great. When sleeping on Eco Terra, you won’t feel any pain, rather you will feel relieved if you often experience back pain. Moreover, the cover material is made from cotton, which means that it is among the comfortable mattresses you will find in the market. Its weight is also not a problem if you want to move it from one room to another. You will also notice that the mattress is easy to clean and maintain. The Eco Terra mattress comes with two comfort options: the medium firm and firm. Medium Firm: This one has an ILD of 24-26 and is best for side sleepers looking for more conformity to their shoulders and hips. However, it still might be firm for people looking for an ultra-plush mattress. On a scale of 1-10 with ten being very firm, this option has a firmness of between 5.5 and 6. Firm: Typically, this is the ideal level of firmness for the back, stomach, and combined sleepers. It is also good for sleepers with back problems because it is sufficiently soft to lessen pressure point, yet firm enough to sustain appropriate alignment. It is highly recommended for heavy individuals. Its firmness comes at around 6.5/10. If you have been experiencing restless nights, acquiring this all-natural latex mattress means you can lay down and have a restful sleep all night long. The latex foam feature provides a high performing supportive base with a unique firmness that you won’t get with the Memory foam mattresses. The medium-firm option, on the other hand, is firmer with minimum sinkage level. Although it is not plush, it is soft enough to enhance your sleeping experience. In case you are looking for a soft and plush sleeping experience, however, this mattress might not be your choice of mattress. The Eco Terra mattress comes in a wide range of sizes including Cal King, King, Queen, Twin/Twin XL, and Full. This means you have a variety to choose from depending on your sleeping preference. On the other side, the blending of latex and coils makes it more receptive than other latex foam mattresses. This makes it pleasurable to sleep on and ensures you can easily get off your bed every morning. What benefits Eco Terra Mattress offer? If you have been wondering what kind of benefits the Eco Terra Mattress offers you, you don’t have to wonder anymore. Here are the benefits that will make you upgrade from your old mattress in favor of Eco Terra. These spring coils are blended with the natural latex fabric to offer you sufficient comfort every night you sleep on it. The coils in this mattress also prevent the disruption that you might feel whenever your partner makes certain movements while sleeping. Additionally, the coils are attuned in a way that provides a reprieve to your pressure areas. The Eco Terra Mattress is naturally handcrafted to provide a lifespan that is much longer than that of the synthetic foam mattresses. The natural latex used in the production of this mattress is very resilient. The fact that it is encased with isolated spring coils, it is deemed to last longer. Its lifespan can also be improved by customizing the various layers of your late bed. This mattress is the closest alternative you can have for the Memory foam mattress. With a sturdy support and the type of buoyancy that comes with this mattress, you are destined to feel the comfort you have been yearning for from your head to toe whenever you are sleeping on it. What’s more, the mattress is stable enough not to move even if you roll over. The fact that it is made from natural latex means that it is built to provide support and comfort to your body while you sleep. You will like the experience of this support every time you wake up. If you experience back pain or pressure on your joints, you can sleep on this firm Eco Terra mattress and by the time you wake up, all the pains will be gone. The 100 percent natural latex layers are optimized for utmost pressure reprieve. They also respond perfectly to your body contours. This means that you will wake up every morning feeling more productive, less hungry, happier, and you will not get sick as often as when you are using a memory foam mattress. The weaving of this mattress is done with a cotton thread. The use of these kinds of threads is meant to prevent it from catching fire. Unlike some mattress brands that use a chemical to make their mattresses fireproof, Eco Terra uses pure organic cotton threads only. The chemicals used by some brands can be dangerous to you and your family. With this mattress, however, you do not have to worry about breathing in harmful chemicals. Mattresses are manufactured from a chemical compound such as petroleum and glue among other artificial elements that bring a bad smell in your bedroom. However, the Eco Terra Mattress features no artificial elements in its production, thus does not pose any kind of threat to your health or to the environment. This makes it eco-friendly and healthy to sleep on. There are not many negative aspects of this all-natural latex mattress. However, since not everything is perfect, here are some of the concerns raised by people who have used the mattress. 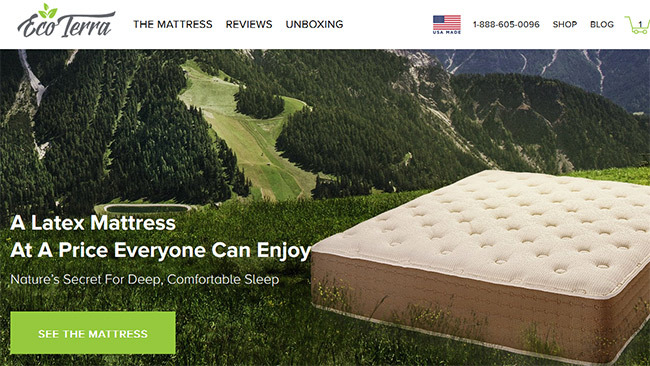 According to some buyers, the mattress isn’t really comfortable as imagined. Although the mattress is medium firm, when they slept on their back they experienced a heating up and were not comfortable while sleeping. To resolve the issue, some of these customers got their mattresses changed with a different one. Another buyer mentioned that the Eco Terra mattress he bought had a chemical known as polyurethane. This chemical element can cause your nose to burn and can be dangerous if smelt for a long time. Like many the boxed products, Eco Terra mattress is also packaged in a box, implying that it has a chemical smell that should dissipate after one day of aeration. Sleeping on this mattress before you air it will not be a good idea if you have sensitive noses. When purchasing a mattress, you should first consider your budget boundary so that you can pick a mattress in a price range that is comfortable for you. Eco Terra Mattress is made from all-natural latex and has a wide range of offers. With its high-quality materials, you can rely on this mattress entirely for a high quality sleep. Unlike other competitor foam mattresses, the Eco Terra is an affordable brand that offers unmatched quality. If you are not convinced with the price charged, you can take advantage of the 90-day trial and test whether the mattress is worth the price. The price of each mattress depends on the size you want to buy. The Eco Terra Mattress is best suited for people who are looking for a stable, secure, and comfortable mattress with plenty of responsiveness and bounce. This is because it relieves pressure from your body allowing you to relax all night long. Should I Buy an Eco Terra Mattress? The decision to buy an Eco Terra mattress will depend on your sleeping preferences. However, this is a great pick for someone who is looking for a mattress fitted with high-end features at a lower price. Even though you will still find other low-priced alternatives, this mattress has a greater warranty that guarantees you a proper use for a long time. The Eco Terra Mattress is among the best giveaways for a high-quality all-natural latex mattress. It offers you the longevity and support of spring coils and a responsiveness that is accompanied by the pressure relief of latex foam all in one affordable package!